Watch the Breaking Bad Alternate Ending! Breaking Bad fans who pick up the Breaking Bad: The Complete Series Blu-ray, which will be released on November 26, will get a very special treat, which links the hit AMC series with Bryan Cranston's hit sitcom Malcolm in the Middle. An alternate ending for the series has been released, which features Bryan Cranston waking up from a dream, describing his drug-dealing escapades to his Malcolm in the Middle wife, Jane Kaczmarek. Take a look at this video, then check out the full details for Breaking Bad: The Complete Series. Fans who are addicted to the series and itching for another hit can now indulge in more than two-hours of never-before-seen footage in a ground-breaking series documentary exclusively in the box set, which comes packaged in a collectible replica barrel representing part of Walter White's dark legacy. The all-new documentary chronicles the making of the final season, from filming the first table read to the very last day on set and everything in between, including Bryan Cranston inviting the camera in to his Albuquerque living room for the first reading of the final script with Aaron Paul. The box set also contains all bonus features from previously released seasons (including retail exclusives formerly only available in select stores), a Los Pollos Hermanos apron and a collectible booklet with a letter from Vince Gilligan, as well as a commemorative Breaking Bad challenge coin designed and created by Gilligan exclusively for this set as a token of appreciation to fans for making the Breaking Bad journey. The dark series includes an exceptional ensemble cast with Anna Gunn (TV's Deadwood), Dean Norris (TV's Under the Dome), Betsy Brandt (TV's The Michael J. Fox Show), RJ Mitte and Bob Odenkirk (The Spectacular Now). Breaking Bad was created by writer/director/producer Vince Gilligan (TV's The X-Files), who also served as executive producer with Academy Award winner Mark Johnson (Rain Man, 1988's Best Picture) and Michelle MacLaren (TV's The X-Files). Co-executive producers of the series include Melissa Bernstein (TV's Rectify), Sam Catlin (TV's Canterbury's Law), George Mastras (TV's The Dresden Files), Peter Gould (TV's Too Big to Fail), Thomas Schnauz (TV's The X-Files) and Moira Walley-Beckett (TV's Pan Am). Stewart Lyons served as Line Producer/UPM. Cranston and Diane Mercer (TV's Arrested Development) are producers of the series. The series is produced by High Bridge and Gran Via Productions in association with Sony Pictures Television for AMC. 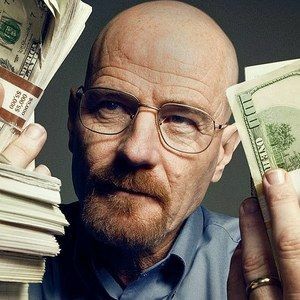 No Half Measures: Creating the Final Season of Breaking Bad - An all-new, exclusive two hour documentary that chronicles the filming of the final eight episodes. - Bryan Cranston: Director - Go on set with Bryan Cranston as he directs the first episode of the season entitled "Blood Money." - Scene Envy - The Cast tell us which scene they wish they could have been in. - Shocking Moments - The stars reveal the moments that shocked them most. - From Walt to Heisenberg - From high school teacher to deadly meth dealer, watch as Walter White quickly transforms into Heisenberg. - How Will It End? - At the beginning of the season, the cast was asked to give their thoughts on how they thought the show would end. - Avenging Agent: Dean Norris as Hank Schrader -- A look at the character Hank Schrader and the man who played him, Dean Norriss. - Scene Stealer: Betsy Brandt as Marie Schrader - A look at the character Marie Schrader and the woman who plays her, Betsy Brandt. - A Criminal Attorney: Bob Odenkirk as Saul Goodman -A look at the character Saul Goodman and the man who played him, Bob Odenkirk. - Jesse's Journey: Aaron Paul as Jesse Pinkman - A look at the character Jesse Pinkman and the man who played him, Aaron Paul. - Skyler Breaks Bad: Anna Gunn on Season Four - Actress Anna Gunn and series creator Vince Gilligan explore Skyler's character evolution through the fourth season. - Growing Up in the White House: RJ Mitte on Walter, Jr. - RJ Mitte, Anna Gunn, Bryan Cranston and series creator Vince Gilligan discuss the extraordinary dynamics of the White family, and Walter, Jr.'s unique role. - The Ultimate Chess Match - Members of the cast and crew discuss Walter White and Gus Fring's extraordinary and complicated battle of wits and their struggle for Jesse's allegiance. - Looking Back: A Season Four Retrospective - Season Four's most surprising and memorable moments. - Ted's Wipeout - In Episode 411, "Crawl Space," Ted Beneke suffers a head injury while trying to escape from Saul's goons. In this featurette, Christopher Cousins (Ted) explains how this shocking stunt was accomplished. - The Truck Attack Storyboard Comparison - A side-by-side comparison of the Los Pollos Hermanos truck attack and the brilliant shot-by-shot storyboards that were created for the episode "Bullet Points." - Walt and the Challenger Storyboard Comparison - A side-by-side comparison of the sequence where Walt indulges in some crazy stunt driving in Walt Jr.'s Dodge Challenger and the storyboards that were created.